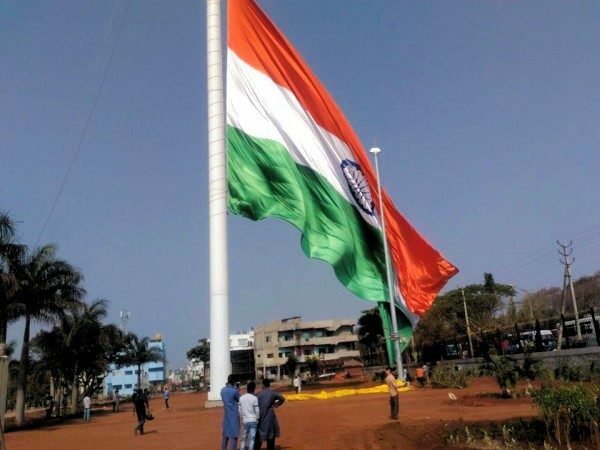 A 360-foot high (110 metres) flag post, said to be of the same height as one at the Indo-Pak Attari Border will be unfurled soon Fort Lake Belagavi. On 22-02-2018 a test unfurling was held today and it was a sight to be believed. Dream Project of MLA Feroz Saith, it was delayed for various reasons mainly technical as clearances were required and now the 360 foot Flag pole is ready and could most probably be officially inaugurated by end of this month mostly in the presence of the Chief minister of Karnataka. The 360 foot high flag post will have a 9600 sq feet National flag measuring 80 /120 feet. The estimated cost of the project is 1.57 crores and another 2.5 crores will be spent for Landscaping. Flag post is been installed at the amphitheater near to the BUDA office in the Fort lake premises. Hey dabba fellow, how much you have donated to poor people, tell me.